Kim? is continuing its new series of events entitled New Arrivals* with the launch of a new digital quarterly called Kim Docs. 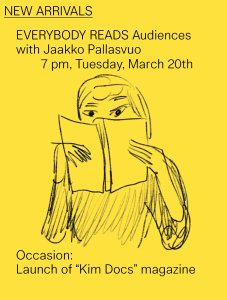 To celebrate the launch, we invite you to the reading night Everybody Reads Audiences with Jaakko Pallasvuo at 7 pm, Tuesday, March 20th. Occasion: The launch of Kim Docs magazine. Kim Docs is a digital quarterly published by Kim? Its first issue is dedicated to the question of audiences. Many questions will pass through the scrolling pages. Who exactly is the contemporary art audience (historically, conceptually, statistically, etc.)? What does it mean for an institution to create its audience or, to make the question more interesting, how do audiences create institutions and influence programming and the scene itself? What choices does an audience have while being entangled by the artistic realm, capital, curatorial frameworks, state, etc. into this gallery-museum-capital-state-complex of contemporary art? With contributions by Santa France, Gints Gabrans, Katerina Gregos, Kaspars Groševs, Katrina Neiburga, Jaakko Pallasvuo, Monika Pormale, Viktor Timofeev, Marta Trektere, Kaspars Vanags, Beti Žerovc, Inga Lāce and others. “Everybody Reads […]!” is a series of nights of horizontal readings that are inspired by both the slogan by Roberto Bolaño: “Reading is always more important than writing” and open structures like Anonymous Alcoholics or Speakers’ Corner at Hyde Park. Everyone attending is kindly invited to read something relating to the chosen topic for that evening. For “Everybody Reads Audiences!”, please don’t be just an audience, be a reader! Bring a joke, create a swearword, add a punch line, read your favourite poem or a text message you are about to receive to the event. Jaakko Pallasvuo (b. 19XX, lives in Helsinki) is an artist. Pallasvuo makes videos, installations, comics, etc. exploring the anxieties of being alive now, and the prospect of a number of possible futures. In recent years his work has been presented at the New York Film Festival, the Museum of Modern Art in Warsaw, TBA21 and Jupiter Woods, among others. *New Arrivals is a new series of public events, lectures, performances, readings, screenings, etc. that may help us to experience the pulse of the ephemeral and fast forward moving art world but also will assist with creating new audiences and organising temporary communities.